Augarten Porzellan is the name of the oldest Austrian porcelain brand - but in fact much more than that. Just like the piano manufactory of Bösendorfer or the Fürst Mozart Balls, the Augarten Porzellan is an integral part of Austrian culture. After Meißner Porzellan, the Augarten Porzellan is the second-oldest porcelain manufactory in Europe. It is named after the Augarten park and Palais in Vienna, where the porcelain is made - right next to another icon of Austrian culture, the headquarter of the Vienna Boys′ Choir. The products of the Augarten Porzellan are sold in a shop at the Augarten itself, but also it various boutiques, some of which sell exclusively Augarten porcelain. Many tourists who come to Vienna purchase porcelain as souvenirs - in fact, the Augarten boutique at the Graben has a Japanese sales assistant and there is a branch of an Augarten store in Tokyo. This reflects how popular Augarten porcelain is in Japan - even the Japanese Imperial Court is said to use Augarten porcelain for dinners and receptions. Augarten porcelain is hand-made and the most expensive porcelain of Austria. 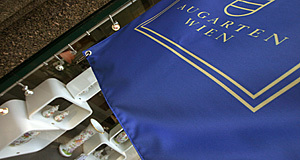 There are several other brands and manufactories around, but due to the close link to the Imperial Court, the Auguarten Porzellan has a very special status - it supplies the Austrian president with representative porcelain, the chancellery, all Austrian embassies and Augarten porcelain is a popular gift at state visits. Alongside with the manufactories of Meißen, Nymphenburg and the Royal Prussian manufactory, the Augarten Porzellan is considered the most exclusive porcelain of Europe - strangely enough, it is very popular in Asia, where porcelain of high quality originates from. The designs originate from a variety of styles and periods: Baroque-Chinese, Rococo, Classicist, floral Biedermeier - and finally Art Deco and contemporary designs. This succession and gap between late Biedermeier and Art Deco makes sense if one takes a closer look at the history of Augarten Porcelain. It goes back to the early 17th century: Europe′s nobility was crazy for Asian porcelain and courtly representation involved the display of porcelain cabinets, elaborate rooms that showed vases, statues and artwork made of porcelain like they were jewellery. The knowledge of how to make porcelain was imported from China and in 1718, Emperor Karl VI granted the exclusive right to found a porcelain manufactory to the high-ranking civil servant Claudius Innocentius du Paquier - a monopoly that applied to all countries of the Habsburg Empire. The first manufactory was in the "Porzellangasse" in today′s 9th district or Alsergrund. Augarten porcelain of the late-Baroque period is still called "Du-Paquier porcelain". In 1744, Empress Maria Theresia withdrew the monopoly from the company and made the manufactory a public institution that belonged to the crown. For the first time, fraud became an issue and stamps were introduced in order to provide a "seal" of authenticity. The style of the porcelain collection became more playful as it developed into Rococo. Continue with "Augarten Porcelain - Part II"